I love ombre, I hope it’s a trend that won’t go out of style for a long time! I also love pom poms and how they look. 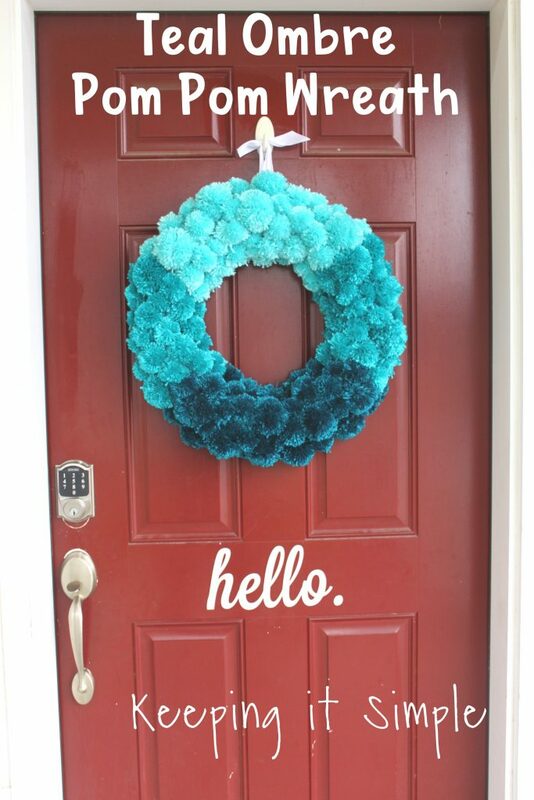 I put the two loves together and created this fun ombre pom pom wreath for my front door. I love how it turned out and I love how it looks when I walk into my door. 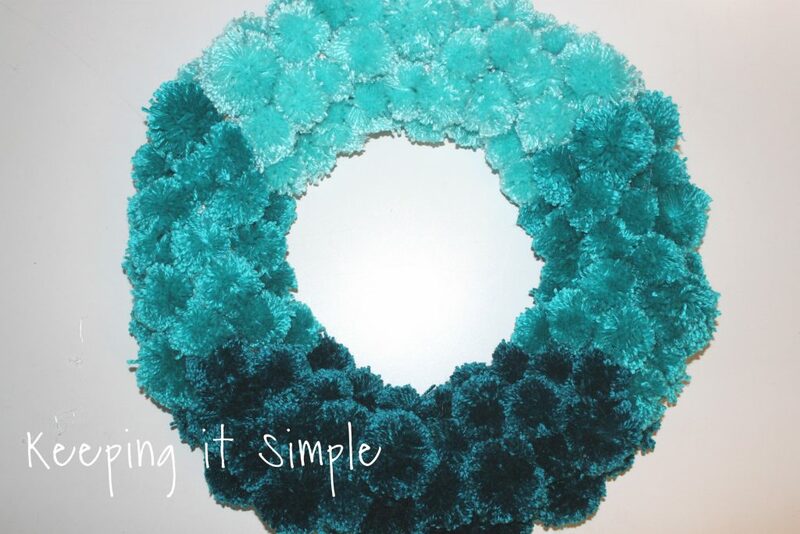 Here is a quick video to show you the process of how to make this awesome teal ombre pom pom wreath. 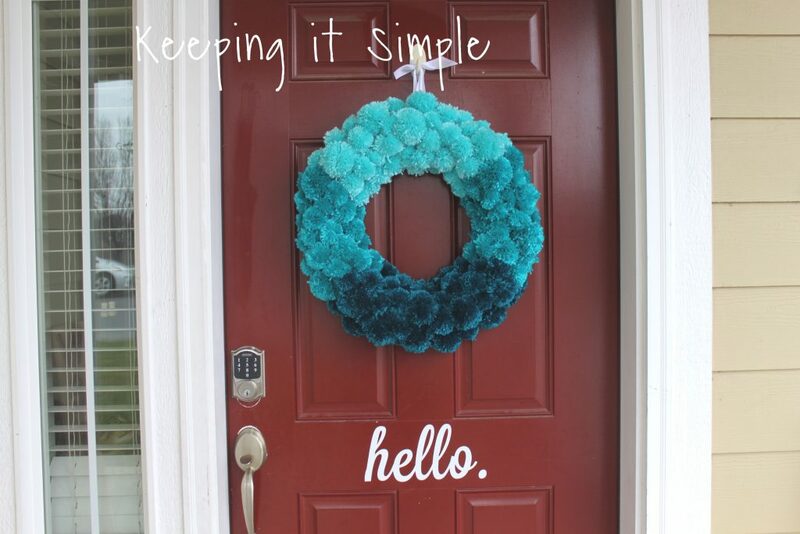 This is how I made the pom pom wreath. 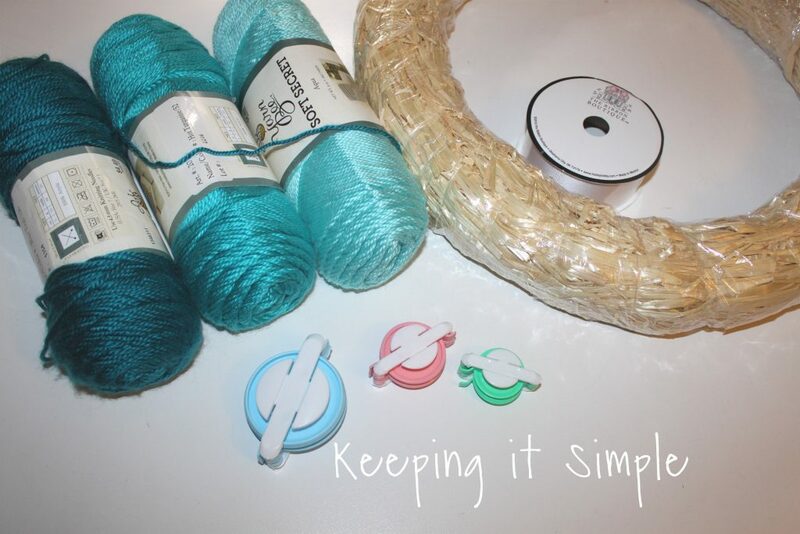 I started with three different colors of yarn, a teal, a turquoise and an aqua color. I got a really soft and shimmery yarn because I loved how it looked. I also used an 18″ straw wreath and a white ribbon. 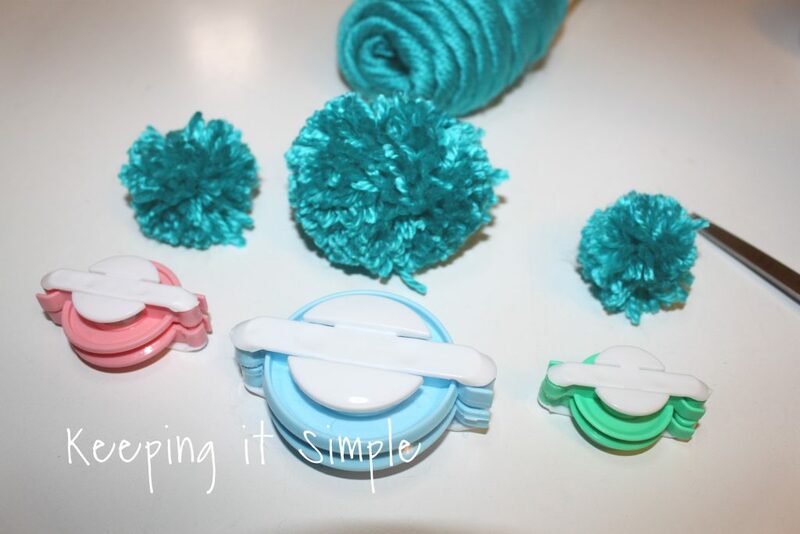 For the pom poms, I used pom pom makers. 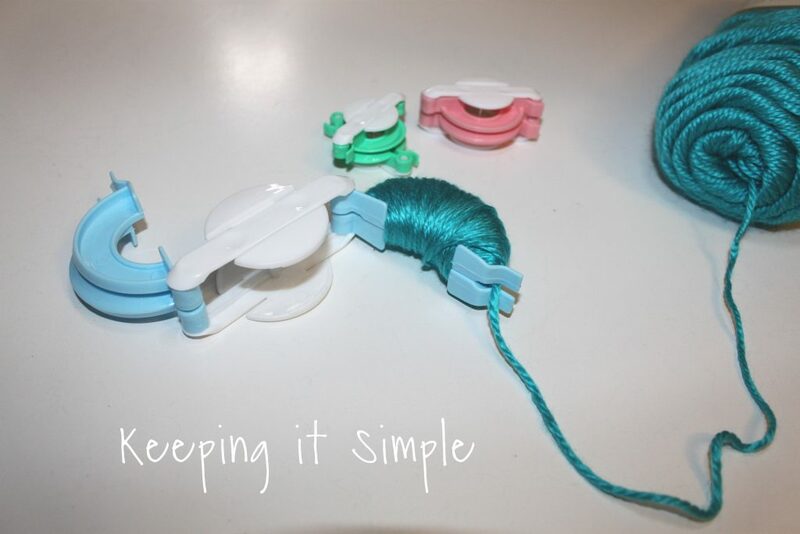 I used the three smaller pom poms makers. 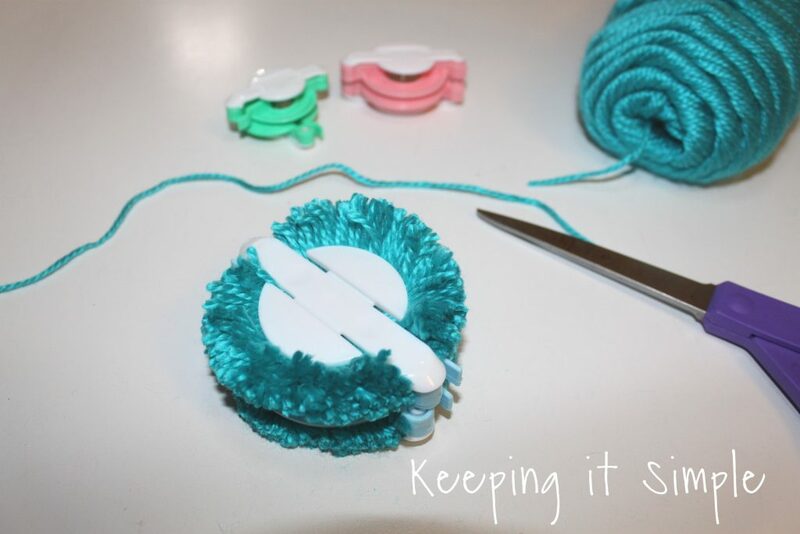 To make the pom poms, I first started by wrapping the yarn around the maker. The more yarn you use to wrap around the maker, the thicker the pom pom will be. 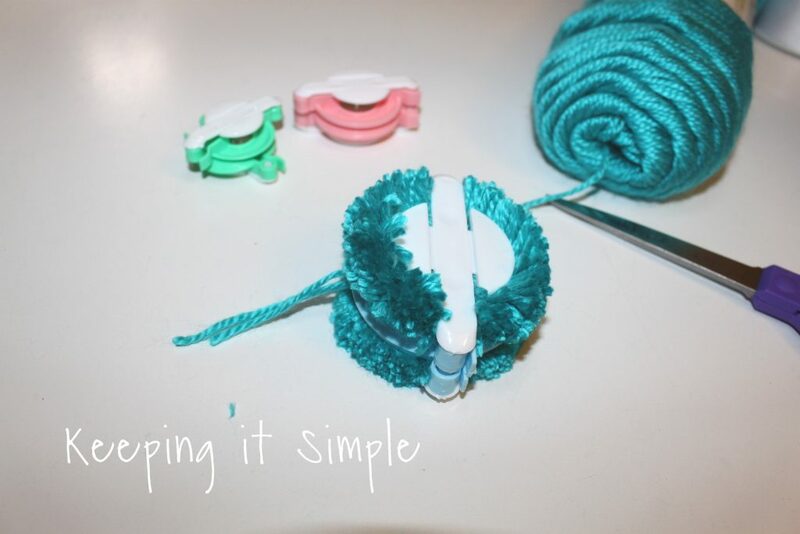 Once I finished wrapping one side of the pom pom maker, I then put the yarn in between the two plastic pieces. I then closed the first side and started to wrap around the other side. 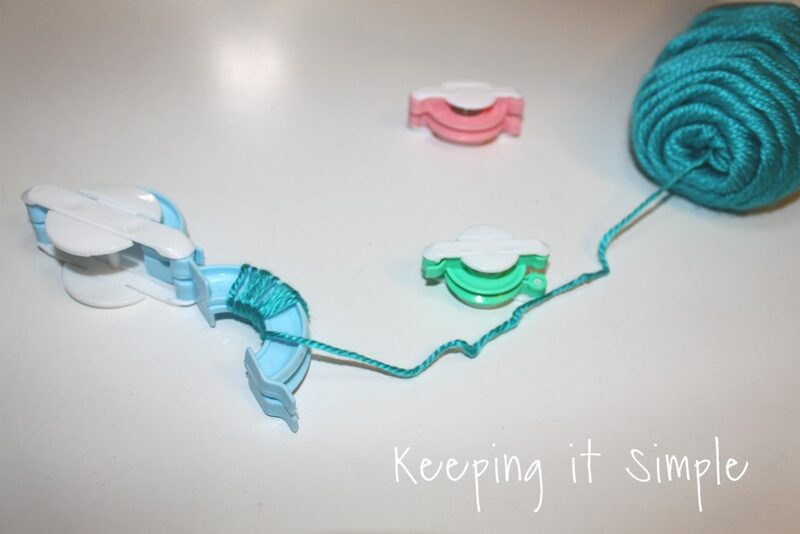 When it was full like the other side, I closed the side and cut the yarn. 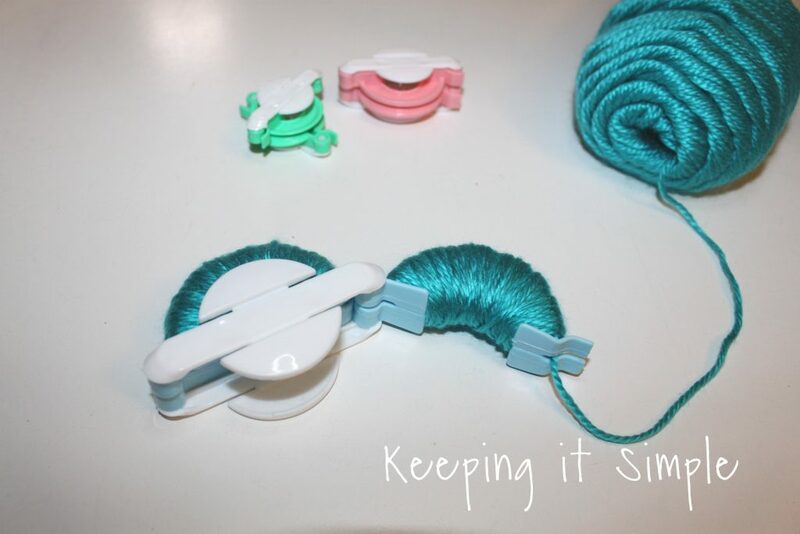 Next I took some sharp scissors (they need to be sharp because there is a lot of yarn you will have to cut through) and cut all along the pom pom maker. After all the yarn was cut, I then cut a little piece of yarn and tied the pom pom together. I tied it on both sides. 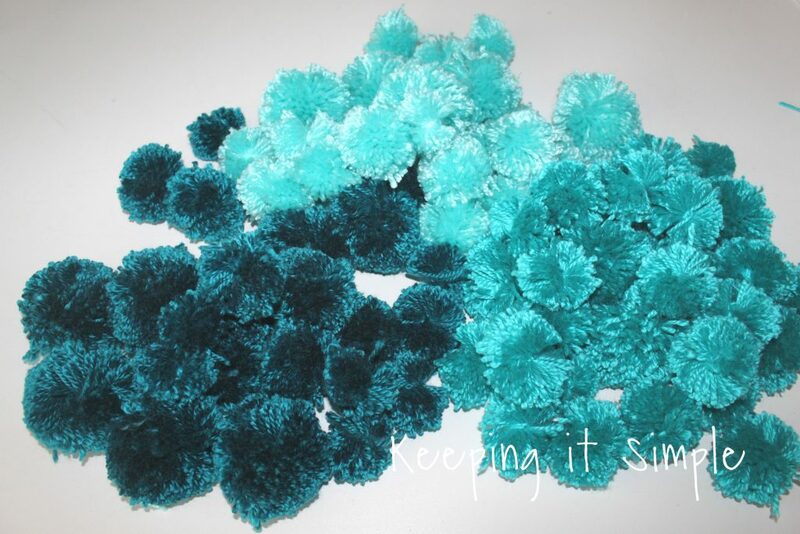 Here are the different sizes of pom poms. The pink size was my favorite for this wreath, I made several of all three but I made the pink one the most. I made lots of pom poms with the three colors of yarn. Isn’t it so pretty? I love the colors! 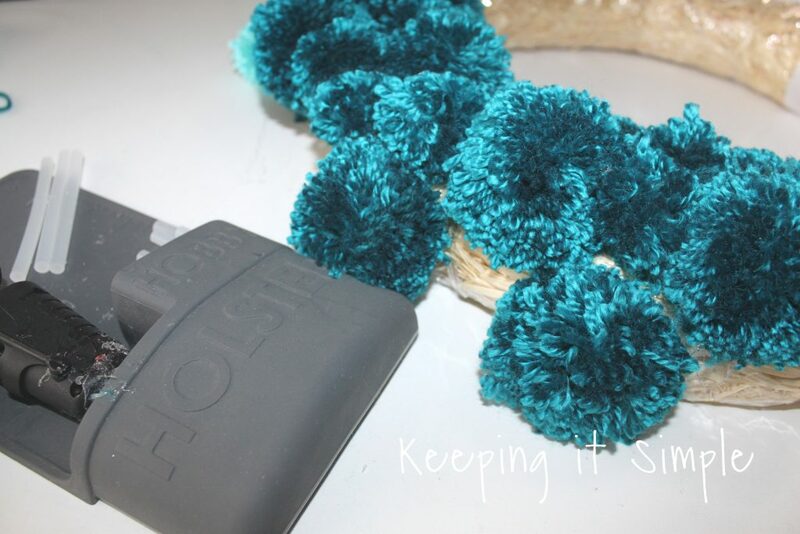 I glued the ribbon onto the top of the straw wreath and then I started to glue the pom poms onto the wreath. I worked on one color and then moved onto the next color. And that’s it! Doesn’t it look so good!? I love the colors. Here it is on my front door, I love it so much! I love how the teal and blue colors look with the red! Also, do you notice my sweet smart lock? 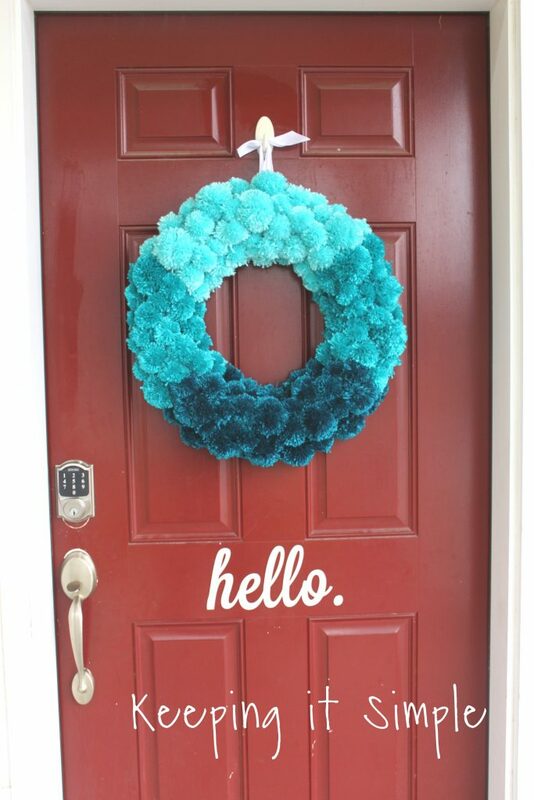 I recommend everyone getting one for their front door, they are awesome! I found it here after browsing around. It’s so nice that we don’t have to worry about keys and my kids can always get inside if the door is locked and I’m not home. That happens a lot with my middle schoolers. Plus this one you can lock and unlock it with your phone, seriously it’s awesome and I recommend having one. I will never go back to a regular bolt lock after having a smart lock. 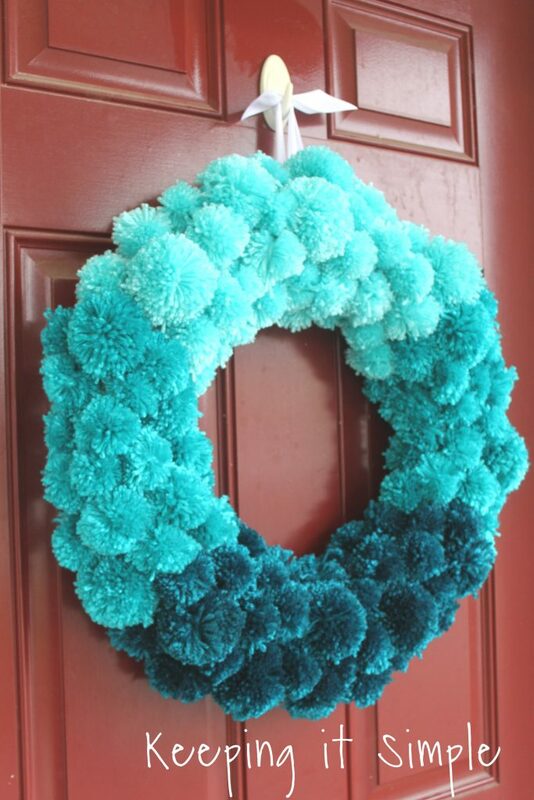 Here is a close up of the sweet ombre pom pom wreath. 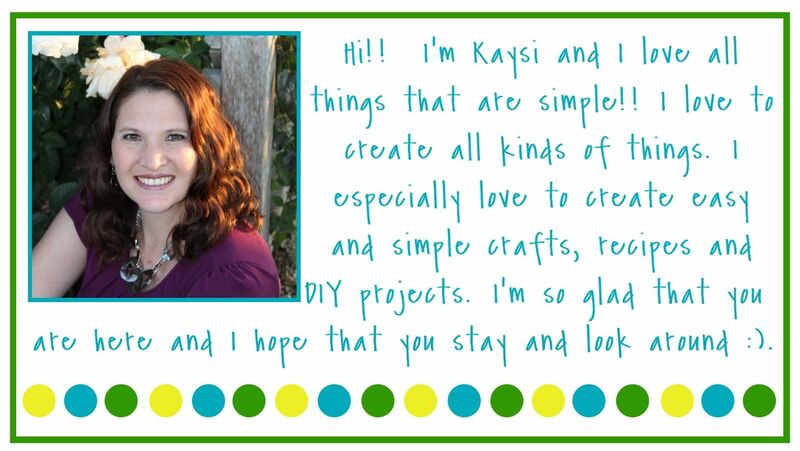 Make sure to check out my other wreaths that I have made!